Chances are, you’ve heard of the term waterproofing. But you may not know exactly what that means. One reason for this is the fact that there is no single clear-cut answer. Generally speaking, waterproofing just means the process of making a structure “resistant to water.” There is more than one way to go about this. In fact, there are different types of waterproofing for different situations. In order to help you understand your choices, we’ll talk about the various waterproofing options and what you need to know. When we think about waterproofing a home, we always look at it in steps. Oftentimes, we start conservatively and step our way up to greater solutions should we not be able to solve the problem with a less-involved approach. Let’s look at some of the steps we’d walk through to achieving the best possible waterproofing solution for you. First and foremost, it’s important to note that proper waterproofing always begins with the exterior of the home. We’re looking to answer: What can be done to help keep water away from the home’s foundation from the outside? Oftentimes this can be achieved with proper grading and gutter downspout extensions. If some basic exterior approaches such as these can keep water from ever building up at the home’s foundation in the first place, then no further solution may be required. Of course, sometimes exterior solutions simply don’t cut it. If this is the case, then the next step in a conservative approach to waterproofing would be to look at crack repair using injections. 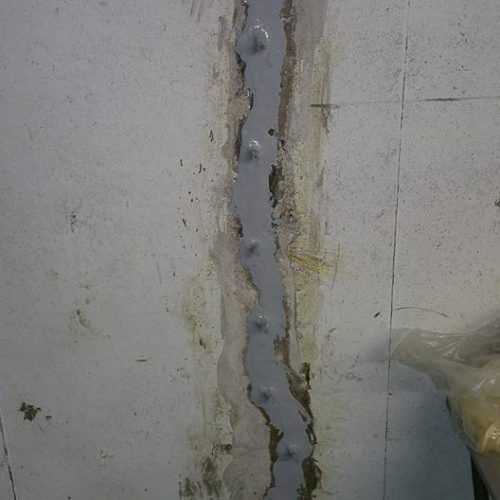 At Adams, we use polyurethane crack injections to seal cracks. This rubbery material comes in fluid resin form which, when injected into cracks, will undergo a chemical transformation from a liquid to a solid. As this occurs, it is expanding exponentially and fully filling every crevice of the crack. In many cases, this will completely solve a water problem. In other cases, we need to go even further. Typically, the next biggest step up from crack repair is choosing an interior tile drain system and a sump pump and pit to waterproof your home. An interior tile drain system is a piping system that captures water at its most common point of entry—the basement floor/wall joint. From there, the system will direct water into the sump pit where a sump pump will flush it out of the home. This complete system is a comprehensive solution to waterproofing and often doesn’t require anything further. However, in cases where water continues to come up from the walls, sometimes it’s also necessary to install a wall shield. This is made of plastic and covers the walls as a protective barrier. Exactly what type of waterproofing your home may require will come down to the specifics of your situation. 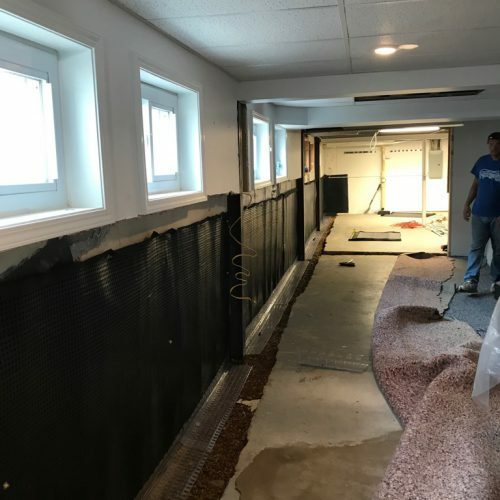 That’s why it’s so important to choose a waterproofing company that is going to take a customized approach to solving your water problems. You want to be able to feel confident that you’re working with a company that will be able to guide you to the best possible solution for you. Should I Repair my Foundation Myself?